Chicago’s The Luck of Eden Hall have been playing and recording their special brand of psychedelia for almost 30 years now. They have a respectable discography of nearly 30 releases, especially considering they were inactive for almost 10 years (1997-2006). 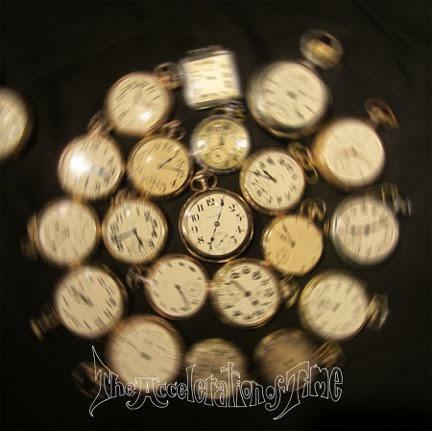 And their newest album, The Acceleration of Time, is perhaps their best release ever, from the psychedelic cover art swirl of pocket watches and the time vortex on the deluxe edition to the 15 excellent songs and instrumentals. Running through out the disc are themes from H.G. Well’s The Time Machine, Pink Floyd’s “Time,” and The Beatles’ “Can’t Buy Me Love.” The Acceleration of Time is pure sci-fi psych ’n roll. The disc opens and closes with clock sounds and chimes, that also appear occasionally throughout the disc. This time around the band gives us a tasteful mix of songs and six incredible instrumental tracks. The unifying link is the Mellotron and excellent guitar work. And as a sign of maturation, the music is not your normal I-VI-V-I chord sequence and simple melodies. Many of the tracks are complex compositions taking the listener through various moods, from the energetic to the sublime. The music is pure Eden Hall, but I detect some nods to The Byrds on “The Family Timekeeper,” a bit of a reference to Jimi Hendrix’ “Third Rock from the Sun” on “Channel 50 Creature Feature,” and Pink Floyd’s “Lucifer Sam” bass riff on “The Happiness Vending Machine.” The entire listening experience is so outstanding, I find it difficult to single out specific favorite tracks. So by all means, grab a copy of this disc for yourself, you won’t be disappointed.